After the game's success on other platforms earlier this year, THQ Nordic has announced that Titan Quest will arrive on Nintendo Switch on 31st July. 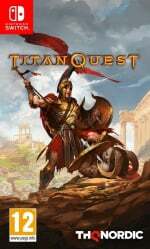 From the minds of Age of Empires co-creator Brian Sullivan, and Braveheart writer Randall Wallace, Titan Quest is an action-RPG set in ancient Greece, Egypt and Asia. The Titans have escaped their eternal prison, wreaking havoc upon the earth. The gods seek a hero who can turn the tide in an epic struggle that will determine the fate of both men and gods. Are you ready for the quest? The game's controls and user interface have been tailor made to work perfectly on Switch, and online multiplayer will let players take on 2-6 player co-op gameplay. Check out this handy, full list of features below. Will you be delving into the monster hunting, hack 'n' slash world of Titan Quest when it smashes onto Switch next month? Share your excitement with us in that comment box below. @NightBeast It's already been confirmed quite a long time ago that it's getting one. Atleast in the states. Had it preordered on Amazon for probably almost a year now haha. Glad this one is arriving far faster than Battle Chasers took. Will pick it up physically sometime around then, pending no other big games appear. Man, wish this came out earlier. I'll be too busy with Octopath and MonHun in July and August until 2019. @Joker13z @NightBeast Retailers have pages for it over here in UK... but then again we had the same for most of the Capcom games until they decided we were scum customers. Wish it had local co-op. Hack and Slash is definitely a genre I'd prefer on a console, as incessant mouse clicking is just dull. I could never get into one for long enough to finish. @XenoShaun Capcom is getting more and more closer to becoming the next Konami with that kind of attitude. Honestly haven't been impressed by them for a long time here. I never got around to playing this, and I was eventually rather heartbroken, seeing what they did to Diablo III, so I might find that I have an itch that needs scratching by now. It this with the First expansion, Immortal throne? or Just the base game? Ragnarok is purchased on the side? Got it on PC and always loved this game. Cannot wait to have it on Switch. This game looks like a blast. Sold! From the creative mind of a co creator of Age of Empires... comes a game basically nothing like Age of Empires! That doesn't mean it will be bad or anything. Just... that'd be like a car commercial "from the creators of the McRiddle sandwich, comes the new McDonalds' 4 person sedan!" Sadly no local coop. I pass. @Joker13z Its a shame. Capcom have some great IPs (oh I wish for something-ANYTHING- Onimusha), and its not even that their games sell bad.. just awful business decisions. Laziest way to make a profit is the future I guess. AT LEAST Konami released their game physical.. overpriced (though the mass post release free content was nice), but still something to commend them for. Something we really shouldn't have to commend any company for. it's fun and a real game. not some crappy mobile thing. it's been out on PC forever. played through it all and it's no diablo but good. 2 player couch co-op may have got my kids to pick it up, they like playing games like this together. Played this and Immortal Throne on PC. Had never played a Diablo game so this was my first experience w/ a game like this and I really enjoyed it. I hated the movement - point w/ a mouse to move there - but it looks like they got rid of that and made normal motion control. Also my first game to ever have a sidekick "pet" companion. Now one of my favorite aspects in any game. Though Tricky in Starfox Adventures was hella annoying. Graphics havent' aged well though, it looks like a quickie storyboard for Horizon or GoW. Since those aren't on Switch, and never will be, would be a nice game for people done w/ Zelda and looking for something remotely similar to play. For those thinking online like MH, I can't recall single giant beast in the game that was worthy of a 4-6 player team. Some nice bosses, but nothing huge. I don't think those existed in any game back then. Haven’t played this style of game in a whIle, quite fancy this. This looks like it's just the base game. I assume that's to nickle and dime you later with Immortal Throne expansion. Considering how old this game is (it was real good for it's time), his should be the Anniversary Edition that includes the sizable expansion. Not a fan of the way they are handling ranged attacks with that ugly colored cone of fire. You hated point and click movement in an isometric ARPG. Sacrilege! Honestly, mouse and keyboard is where it's at for games like this (look at their band aid solution for picking ranged targets...) for no other reason then item management. Dealing with inventory lists in consolized ARPG's is dreadful. @Alcovitch How can they justify the base game only? This is not right. In the video you can see the Dream mastery which was added in immortal throne. But then again the footage is from Xbox gameplay. Need more info on that!!! @Alcovitch "Dealing with inventory lists in consolized ARPG's is dreadful." I hadn't thought of that. But I'll deal as long as my guy moves when I press the left stick. I've always been a console gamer, not a PC gamer, so I'm used to inventory management, no matter how it's shoehorned in. @rjejr I used to hate this kind of inventory on consoles but since I played Diablo on PSP I learned gamepad management and it is not that bad now. Hi Everyone, just checked PS4 version, and it's the full Immortal throne one. So it can be pretty much expected the same for switch. Hopefully its 60FPS. I have this on PS4, fun but full of glitches. @rjejr Not liking a mouse....for a point and click isometric ARPG? I mean the game was designed to be played with a mouse. That's like saying you hate using Wiimotes to play Wii Sports or hate using the Game Pad to play Mario Maker, or hate using the stylus to play Kid Icaru....err...ok, I'll give you that one. @Kimyonaakuma It's a real game. It's actaully an old-ish PC game from the mid '00s originally published by Sierra as a kind of mythology based alternative to Diablo II. It's actually a really good game. Doesn't have quite the timelessness of Diablo II, but it's close and it does some things better. It may seem a little "too PC" and slightly antiquated in ways on a console, but I'd highly recommend it if you like ARPG/hack & slash/point & click RPGs like Diablo. Seriously, I played wayyyyyyy too much titan quest back in the day so yeah you can have all of my money. If anybody wants to tell MS to put its older Age of Empires games on the switch I would not complain. I've been eager for a Diablo clone. Looking forward to this. @NEStalgia Maybe we should get rid of sticks entirely and all go back to playing 3rd person action games with tank controls. Great game...I played it to the point of burn out back when it came out on pc...I might buy on sale for nostalgia. If you haven't played and you love Diablo...this is for you...it's a real treat. @rjejr I'm pretty sure anyone who likes the DualShock is all for that! If the price is right, imma get it.